To use Google's Family Link, a parent must have a Google account. 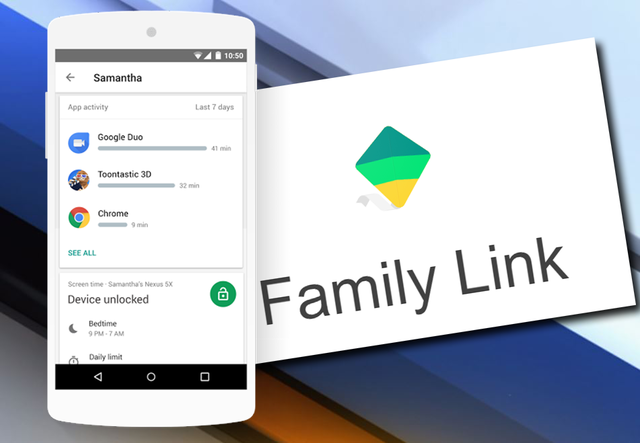 Download the Android Family Link App on the child's device, as well as the parent device. Create a Google Account for your child through the Family Link App. If your child already has a Google account, you will have to create a new one. Follow the prompts for the initial set up. 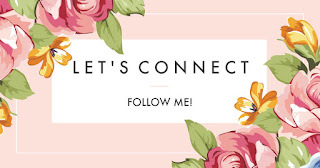 It's very easy to follow. 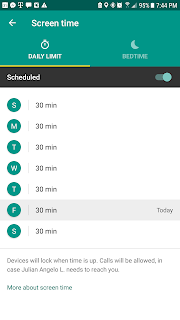 What Can You Control with the Family Link App? 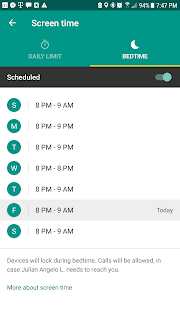 Screen Time - Control daily time limits and bed time. Once the time limit has been reached or bed time arrives, the device will lock. Parents can unlock on the child's device with a code created on the app on the parent phone or the parent can unlock the device from their own phone. When the device is locked, their child's phone will still be able to make outgoing calls to anyone and receive incoming calls from anyone. Google Play downloads - There are different settings on the extent to which parents will allow their child to download apps, as well as the content of the apps you will allow. Websites on Chrome - Parents have the options to control which websites the child will have access to. Android Apps - Parents can block certain apps that come "stock" with the phone. 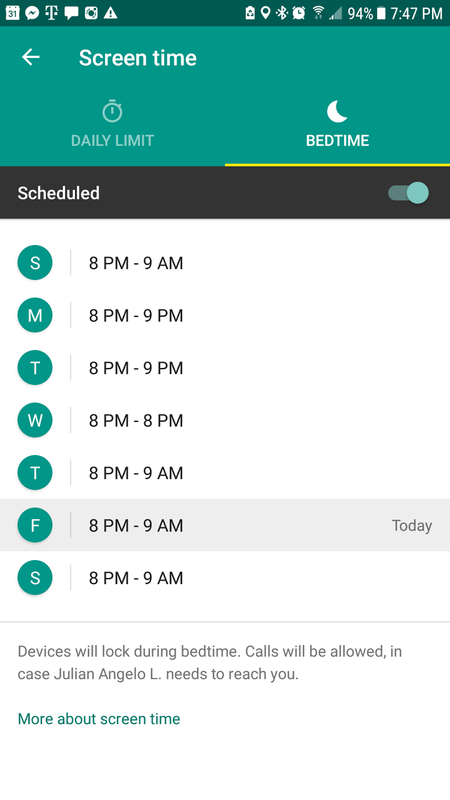 Parents can also see the minutes spent on each app per week and per month. Location - This options allows the Family Link App to track the child's location. Ability to see a log of websites visited on the app. Parents will need to view the "history" on Chrome itself on your child's phone. Limit incoming and outgoing calls to phone numbers approved by the parent. Password to access the Family Link App on the parent phone to avoid the child hacking the parents phone to change the settings. Yes, my son had tried. 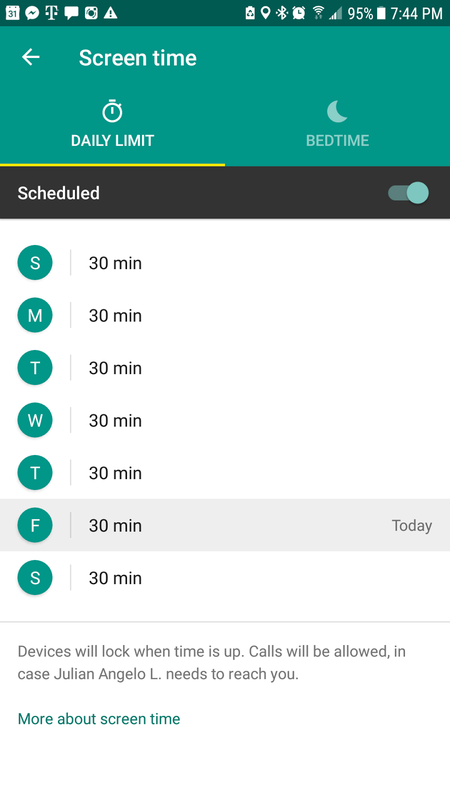 App activity should list the minutes for the day, not only the week and month. This has been the most user-friendly parental control app I've tried. I like that it automatically synced with the other Google apps and works well with the Android operating system. It has worked really well for me so far. When my son is acting up and needs a consequence, I'll lock his phone. When he downloads apps, I get a notification on my phone for approval. When he's has his phone, I can track which apps he's been using and how long he's spent on each one. I just hope Apple will take what Google has created and make something similar, if not better, to work with Apple devices. For more information on the Google Family Link App, visit https://families.google.com/familylink/.